Couperin (anon. ), collection of the Château de Versailles. François Couperin (French: [fʁɑ̃swa kupʁɛ̃]; 10 November 1668 – 11 September 1733) was a French Baroque composer, organist and harpsichordist. He was known as Couperin le Grand ("Couperin the Great") to distinguish him from other members of the musically talented Couperin family. Couperin was born into one of the best known musical families of Europe. His father Charles was organist at Church Saint-Gervais in Paris, a position previously occupied by Charles' brother Louis Couperin, a highly regarded keyboard virtuoso and composer whose career was cut short by an early death. As a boy, François must have received his first music lessons from his father. Unfortunately, Charles died in 1679. The church council at Saint-Gervais hired Michel Richard Delalande to serve as new organist, with the condition that François would replace him at age 18. Meanwhile, the boy was taken care of and taught by organist Jacques-Denis Thomelin, who served both at the court and at the famous church of St Jacques-de-la-Boucherie. According to a biography by Évrard Titon du Tillet, Thomelin treated the boy extremely well and became "a second father" to him. François's talent must have manifested itself quite early, since already by 1685 the church council agreed to provide him with a regular salary even though he had no formal contract. Couperin's mother Marie (née Guérin) died in 1690, but otherwise his life and career were accompanied by good fortune. In 1689 he married one Marie-Anne Ansault, daughter of a prosperous well-connected family. The next year saw the publication of Couperin's Pieces d'orgue, a collection of organ masses that was praised by Delalande (who may have assisted with both composition and publication). In three more years Couperin succeeded his former teacher Thomelin at the court. The new appointment was extremely prestigious and brought Couperin in contact with some of the finest composers of his time, as well as numerous members of the aristocracy. His earliest chamber music dates from around that time. The numerous duties Couperin carried out at the court were accompanied by duties as organist at Saint Gervais, and also by the composition and publication of new music. He obtained a 20-year royal privilege to publish in 1713 and used it immediately to issue the first volume (out of four) of his harpsichord works, Pieces de clavecin. A harpsichord playing manual followed in 1716, as well as other collections of keyboard and chamber music. In 1717 Couperin succeeded one of his most eminent colleagues, Jean-Baptiste-Henry d'Anglebert, as ordinaire de la musique de la chambre du roi pour le clavecin, one of the highest possible appointments for a court musician. However, his involvement in the musical activities at the court may have lessened after Louis XIV's death in 1715. Couperin's health declined steadily throughout the 1720s. The services of a cousin were required by 1723 at Saint Gervais, and in 1730 Couperin's position as court harpsichordist was taken up by his daughter Marguerite-Antoinette. Couperin's final publications were Pièces de violes (1728) and the fourth volume of harpsichord pieces (1730). The composer died in 1733. The building where Couperin and his family lived since 1724 still stands and is located at the corner of the rue Radziwill and the rue des Petits Champs. The composer was survived by at least three of his children: Marguerite-Antoinette, who continued working as court harpsichordist until 1741, Marie-Madeleine (Marie-Cécile), who became a nun and may have worked as organist at the Maubuisson Abbey, and François-Laurent, who according to contemporary sources left the family after François died. Couperin acknowledged his debt to the Italian composer Corelli. He introduced Corelli's trio sonata form to France. Couperin's grand trio sonata was subtitled Le Parnasse, ou L'apothéose de Corelli ("Parnassus, or the Apotheosis of Corelli"). In it he blended the Italian and French styles of music in a set of pieces which he called Les goûts réunis ("Styles Reunited"). Couperin's four volumes of harpsichord music, published in Paris in 1713, 1717, 1722, and 1730, contain over 230 individual pieces, which can be played on solo harpsichord or performed as small chamber works. These pieces were not grouped into suites, as was the common practice, but ordres, which were Couperin's own version of suites containing traditional dances as well as descriptive pieces. The first and last pieces in an ordre were of the same tonality, but the middle pieces could be in other closely related tonalities. These volumes were loved by Johann Sebastian Bach and, much later, Richard Strauss, as well as Maurice Ravel who memorialized their composer with Le tombeau de Couperin (Couperin's Memorial). Many of Couperin's keyboard pieces have evocative, picturesque titles (such as "The mysterious barricades") and express a mood through key choices, adventurous harmonies and (resolved) discords. They have been likened to miniature tone poems. These features attracted Richard Strauss, who orchestrated some of them. Only one collection of organ music by Couperin survives, the Pièces d'orgue consistantes en deux messes ("Pieces for Organ Consisting of Two Masses"), the first manuscript of which appeared around 1689–1690. 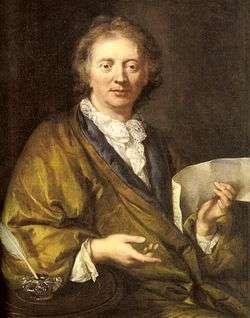 At the age of 21, Couperin probably had neither the funds nor the reputation to obtain widespread publication, but the work was approved by his teacher, Michel Richard Delalande, who wrote that the music was "very beautiful and worthy of being given to the public." The two masses were intended for different audiences: the first for parishes or secular churches ("paroisses pour les fêtes solemnelles"), and the second for convents or abbey churches ("couvents de religieux et religieuses"). These masses are divided into many movements in accordance with the traditional structure of the Latin Mass: Kyrie (5 movements), Gloria (9), Sanctus (3), Agnus (2), and an additional Offertoire and Deo gratias to conclude each mass. ↑ Gustafson 2004, p. 115ff. ↑ Apel 1972, p. 736ff. ↑ Gustafson 2004, p. 115. ↑ Apel 1972, p. 737. ↑ Gustafson 2004, p. 116. ↑ Apel 1972, p. 738. Apel, Willi (1972). The History of Keyboard Music to 1700. Bloomington: Indiana University Press. pp. 736–738. Gauthier, Laure (2008). Mélodies urbaines: la musique dans les villes d'Europe (XVIe-XIXe siécles) (in French). Presses Paris Sorbonne. p. 256. ISBN 978-2-84050-563-1. Retrieved 2013-05-27. Gustafson, Bruce (2004). "France". In Alexander Silbiger. Keyboard Music Before 1700. New York: Routledge. pp. 115–116. Savall, Jordi (2005), François Couperin: Les Concerts Royaux (CD liner notes), Alia Vox, AV9840, Couperin est le musicien-poète par excellence, qui croit en la capacité de la Musique à s'exprimer avec «sa prose et ses vers»...si on entre dans sa profonde dimension poétique, on découvre qu'ils [referring to the occasional pieces such as Les Concerts Royaux] sont porteurs d’une grâce qui est, «plus belle encore que la beauté...». Wikimedia Commons has media related to François Couperin.